Lead is a common metal found throughout the environment in lead -based paint, air, soil, household dust, food, certain types of pottery, porcelain, pewter, and in drinking water. Lead can pose a significant risk to your health. It can cause damage to the brain, red blood cells and kidneys. The greatest risk is to young children and pregnant women. Lead has been shown to slow down normal mental and physical development of infants and children. Lead enters drinking water primarily as a result of the corrosion, or wearing away, of materials containing lead in the water distribution system and plumbing. These materials include lead-based solder used to join copper pipe, brass and chrome plated faucets, and in some cases, pipes made of lead. You can evaluate various means to reduce lead levels. This may include replacing fixtures and piping that may be contributing lead to the water and/or installing chemical corrosion control treatment. The program selected should be conducted in accordance with the requirements of the EPA, the State of Oregon, Oregon Health Authority and your local health department. Water often sits in the pipes for several hours. Q: Why is lead a problem? A: Although it has been used in numerous consumer products, lead is a toxic metal now known to be harmful to human health if inhaled or ingested. Important sources of lead exposure include: ambient air, soil and dust (both inside and outside the home), food (which can be contaminated by lead in the air or in food containers), and water (from the corrosion of plumbing). On average, it is estimated that lead in drinking water contributes between 10 and 20 percent of total exposure (from all sources). Known effects of exposure to lead range from subtle biochemical changes at low levels of exposure, to severe neurological and toxic effects or even death at extremely high levels. Q: Does lead affect everyone equally? A: Young children, infants and fetuses appear to be particularly vulnerable to lead poisoning. A dose of lead that would have little effect on an adult can have a big effect on a small body. Also, growing children will more rapidly absorb any lead they consume. A child’s mental and physical development can be irreversibly stunted by over -exposure to lead. In infants, whose diet consists of liquids made with water makes up an even greater proportion of total lead exposure (40 to 60 percent). Q: How could lead get into my drinking water? Q: Does my home’s age make a difference? A: Lead -contaminated drinking water is most often a problem in houses that are very old or very new. Up through the early 1990’s, it was common practice, in some areas of the country, to use lead pipes for interior plumbing. Also, lead piping was often used for the service connections that join residences to public water supplies. (This practice ended only recently in some localities.) Plumbing installed before 1930 is most likely to contain lead. Copper pipes have replaced lead pipes in most residential plumbing. However, the use of lead solder with copper pipes is widespread. Experts regard this lead solder as the major cause of lead contamination of household water in U. S. homes today. New brass faucets and fittings can also leach lead, even though they are “lead -free.” Scientific data indicate that the newer the home, the greater the risk of lead contamination. Lead levels decrease as a building ages. This is because, as time passes, mineral deposits form a coating on the inside of the pipes (if the water is not corrosive). This coating insulates the water from the solder. But, during the first five years (before the coating forms) water is in direct contact with the lead. More likely than not, water in buildings less than five years old has high levels of lead contamination. 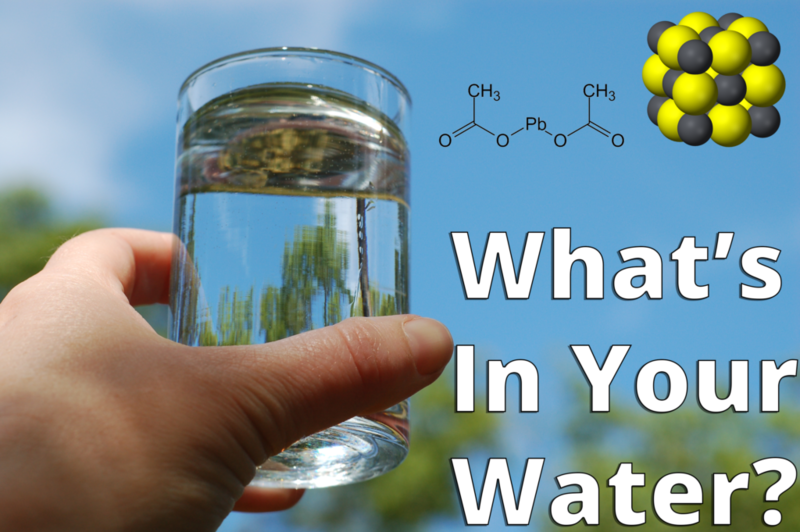 Q: How can I tell if my water contains too much lead? A: You should have your water tested for lead. Testing costs between $20 and $100. Since you cannot see, taste, or smell lead dissolved in water, testing is the only sure way of telling whether or not there are harmful quantities of lead in your drinking water. You should be particularly suspicious if your home has lead pipes (lead is a dull gray metal that is soft enough to be easily scratched with a house key), if you see signs of corrosion (frequent leaks, rust colored water, stained dishes or laundry, or if your non – plastic plumbing is less than five years old). Your water supplier may have useful information, including whether or not the service connector used in your home or area is made of lead. Testing is especially important in high-rise buildings where flushing might not work. Q: How do I have my water tested? A: Water samples from the tap will have to be collected and sent to a qualified laboratory for analysis. Contact your local water utility or your local health department for information and assistance. In some instances, these authorities will test your tap water for you, or they can refer you to a qualified laboratory. Contact the CTDPH Laboratory Certification Program, at 860-509-7389, to find out which laboratories have been certified for conducting lead analyses. Q: What are the testing procedures? A: Arrangements for sample collection will vary. A few laboratories will send a trained technician to take the samples; but in most cases, the lab will provide sample containers along with instructions as to how you should draw your own tap -water samples. If you collect the samples yourself, make sure you follow the lab’s instructions exactly. Otherwise, the results might not be reliable. Make sure that the laboratory is following EPA’s water sampling and analysis procedures. Be certain to take a “first draw” and a “fully flushed” sample. Q: How much lead is too much? A: Federal standards initially limited the amount of lead in water to 50 ppb. In light of new health and exposure data, EPA has set an action level of 15 ppb. If tests show that the level of lead in your household water is in the area of 15 ppb or higher, it is advisable, especially if there are young children in the home, to reduce the lead level in your tap water as much as possible. (EPA estimates that more than 40 million U. S. residents use water that can contain lead in excess of 15 ppb.) Note: One ppb is equal to 1.0 micrograms per liter (μg/1) or 0.001 milligrams per liter (mg/1). Q: How can I reduce my exposure? A: If your drinking water is contaminated with lead, or until you find out for sure, there are several things you can do to minimize your exposure. Two of these actions should be taken right away by everyone who has, or suspects, a problem. The advisability of other actions listed here will depend upon your particular circumstances. The following simple steps can be taken to reduce your exposure to lead in drinking water. This is a simple and inexpensive measure you can take to protect your health. “Flush” the tap before using the water for consumption. with the problem of lead contamination. Drinking water can be treated at the plant to make it less corrosive (Treatment to reduce corrosion will also save you and the water supplier money reducing damage to plumbing.) Water mains containing lead pipes can be replaced, as well as those portions of lead service connections that are under the jurisdiction of the supplier. • If you own a well or another water source, you can treat the water to make it less corrosive. Corrosion control devices for individual households include calcite filters and other devices. Calcite filters should be installed in the line between the water source and any lead service connections or lead-soldered pipe. 1Daniel B. BreedingAnother satisfied customer! 1Julie and Kevin EffingerAnother satisfied customer! What a great company!! Thank you for everything, especially the Military Discount. We hit rock bottom when we both lost our jobs and we are working hard to get back on top so your generosity is greatly appreciated. I will report your excellent service with the BBB and recommend you to friends and family. Mark @ Top Notch handled my home inspection and I couldn’t be happier! He took the time to do the job right and provided us with a very detailed report! He was kind and professional and I will be recommending Top Notch Home Inspections to all my friends and family! I just wanted to write you and tell you what a Stellar young man you have working for you, and that is Spencer. He is such an asset to you and you probably already know that. We had an amazing conversation yesterday, and WOW, what a great attitude he has. He also did primo work. Cleaned up after himself and you hardly even knew he pulled the toilet or any signs of him there. I hope he continues to have the opportunity in your company to keep growing. I will recommend your company to anyone. Thank you again Jeff. You are a great person also. I am glad I found your company.